By stayhomecupcake on January 31st, 2013 . Filed under: Cupcake Ideas, Decorating, Holidays, Home Decor, Valentines Day . I love walking through the stores this time of year because so many stores pair cupcakes and hearts in their Valentine’s decor items. 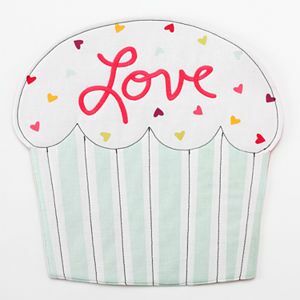 So far I have spotted cuppies in the Valentine’s sections at Walmart, Target, Michael’s, Hobby Lobby, Christmas Tree Shop and Kohl’s. So a big thank you to all the stores who join cupcakes and hearts this holiday season. You make it so much more special for the cupcake obsessed. All Things Cupcake appreciates you! looks great! I’m going to try these for my nieces b-day.